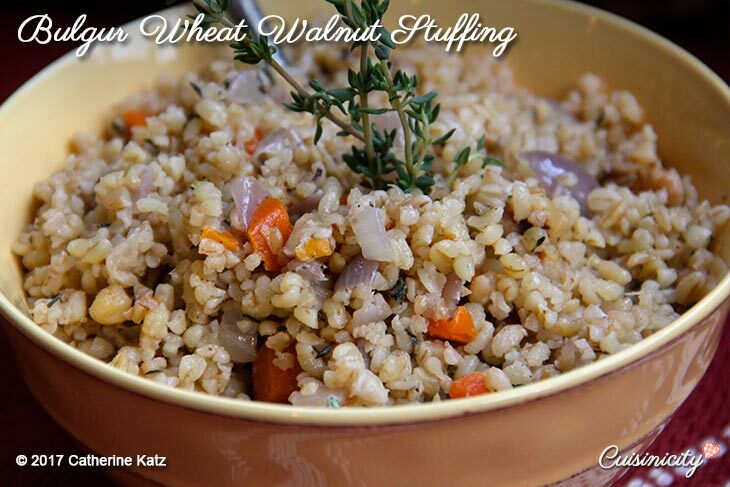 My bulgur wheat walnut stuffing is SO good that you’ll want to eat it right out of the bowl, so just go for it! That’s exactly what my kids do! Now that they are all old enough, they make this old-time family favorite all the time in their own kitchens, without thinking twice about it. 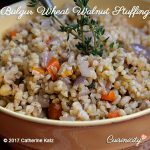 They just always have dry bulgur wheat on hand in their pantry (you only need 3/4 cup for this whole recipe, so a little goes a long way–here is a brand I like). It’s filled with nutrients: 100% wholegrain, veggies, walnuts and it can just be dinner, or a delicious side dish with your favorite meal. No fuss: It’s so quick and easy to make and it’s so yummy, satisfying and filling…and it does a mama’s heart a lot of good! Add the dry bulgur wheat to the pan and continue to cook while stirring for a few seconds and add sage, thyme, salt and pepper. Remove from heat and stir in ground walnuts. I made this recipe for the first time a few days ago and it was wonderful. So easy and so versatile. I love stuffing! Can’t wait to try this recipe; so much healthier that bread-based. And, I’m sure, more flavorful too! Thank you Donna! and really it’s so yummy, I just use it all the time as a main dish that I just serve with roasted or grilled veggies and it’s just perfect!! I can’t wait for youth try it!